Americas Cardroom is doing it right! They have the Sunday Beast Sit and Crush tournament where two lucky winners get a package for their Cage Live event. 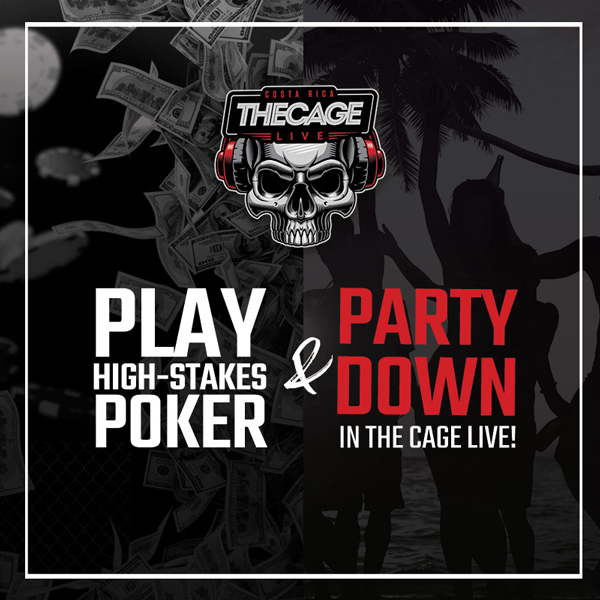 The Cage Live is a timed poker tournament that runs over two days with two 3 hour events both days. The winner is the player with the most chips at the end of the tournament. It’s a combo of tournament and cash game created by Americas Cardroom management and it’s catching on. Players don’t have to play for 12 and 15 hours like some tournaments. The time limit puts a stop to this. Players have less fatigue that comes with long tournaments. The buy-in for the satellite to the event is $55. The buy-in for the Main Cage Live event is $5250. Players also get an option to have a second buy ready if they bust out. Americas Cardroom also has the weekly Cage online at their website. Playing can give you the feel of the real deal. They buy-in is $1000. At the end, they convert your chips to cash! 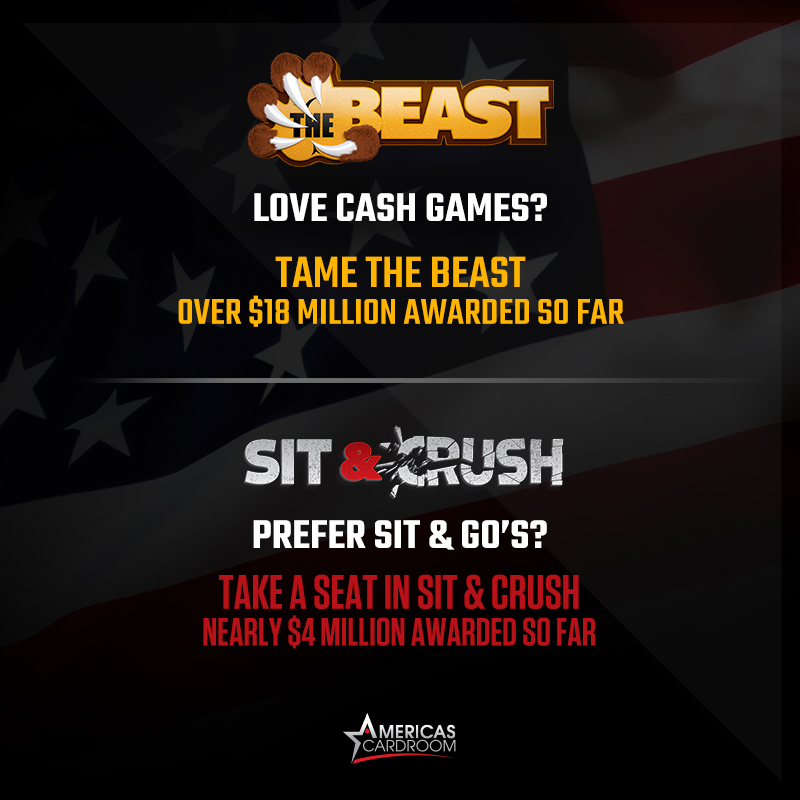 Winners of the Beast Sit and Crush on Sundays get a $8340 package that includes airfare, hotel stay, the buy-in and more cash to play at ACR. For the Cage Live at Costa Rica winners include Troy Quenneville who took home $51,315 in January 2019, and poker pro Thomas Cannuli. The remaining dates for the Cage Live in 2019 are May 31st-June 3rd, August 9th – 12th, October 4th – 7th (Pot Limit Omaha) and December 6th – 9th also Pot Limit Omaha. The Taorminia is a top rated Hotel and Casino in Costa Rica. It has all the modern amenities and great places like Il Gattopardo, an Italian restaurant. The top notch restaurant serves the latest in food trends. There is also a casino with slots and table games as well. The sports bar will keep you up to date with the latest news while you’re in Costa Rica. If you’re on vacation and might be interested in playing, the buy-in is $5,250. You can also win by playing at Americas Cardroom in the $55 Beast and Sit and Crush tourney each Sunday at 6 pm. You also get a hot package including hotel, airfare and spending cash. A total package of $8340 is on the table every Sunday. Players start with 5,000 in tournament chips. 30 minute break every level. Players’ antes are paid by the button player. This format speeds up the overall play. There will also be a double buy option where prize pools increase substantially. Before the tournament starts, a player can buy an extra entry for $5250 and have more chips to redeem if necessary. If it’s not used throughout the tournament, it gets refunded. The current winner of the Live Cage is Sam Soverel who won $36,030 in March 2019. You could be next or have lots of fun in Costa Rica!! Anyone who plays poker know that winners get a share of the pot. So, winning a million dollar tournament would give you a share of the pot. If lucky and you win, it’s around $200,000 depending on the amount of players. But coming in July, Americas Cardroom will have the $5 Million Dollar Venom Tournament where the winner walks away with a cool million dollars. After everything the winner is getting a million dollars – some cool cash! This would become the largest pot of any US poker room in history. 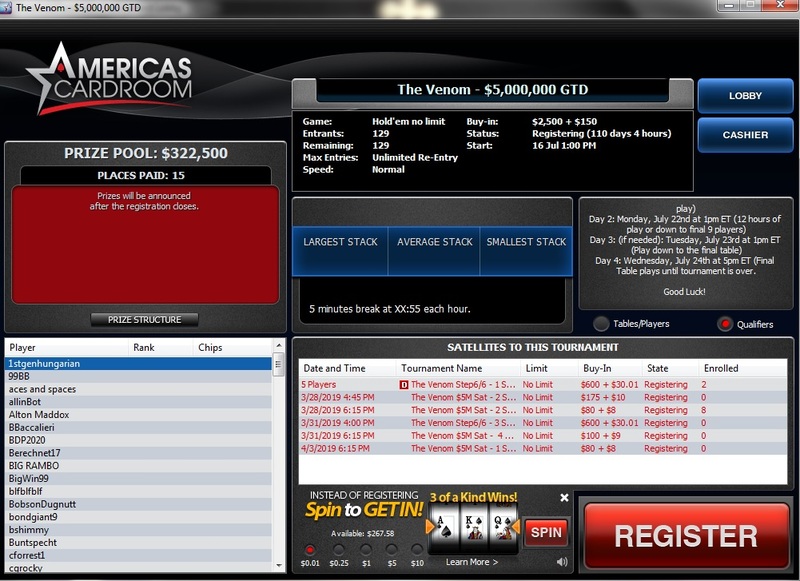 And now is a great time to check out Americas Cardroom. With a jackpot so high the buy-in is a mind boggling $2650 but there are satellites and steps events where you can win your seat to the event for free. Signing up is as easy as creating a poker name you want to use and creating a password. There are six tournaments that can get you in the Venom tourney. Everyday Americas Cardroom has six freerolls and there are on demand tournaments that range from $6 and up to $600. The $600 tournament winner is guaranteed a seat. The other tournaments are satellites to the $600 tournament. All along the way, players can opt to buy-in as well. Or you could buy-in for $2650. If you do get lucky, it’s best to have a backup entry just in case. And players can win multiple entries as well. There is also the spin to get in feature. You can get into the tournament for as low as a penny if you get lucky. To use this feature go to the Venom Tournament page and at the bottom, you’ll find the Spin to get in feature. Simply click and see if you get lucky. The spin to get in is right here. When you click spin the wheel will show 3 cards, if they match you get a free entry. The spins are from a penny and go up to a dollar. This is for all tournaments as well! 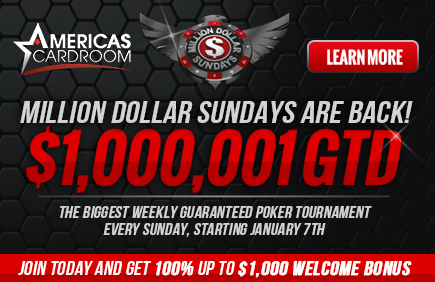 Signing up at Americas Cardroom will also get many bonuses. A sign up bonus that matches your deposit. Most casinos have this option. I’m not sure of the cash out potential it may be for playing only. Regular players get loyalty rewards, the more you play, the faster they accumulate. Always check the rewards section to see for your reward status. Brian Hasting Won the H.O.R.S.E. $3000 buy-in event at the 2018 WSOP. He gets his fourth gold bracelet and $232,202 in cash for first place. He triumphed over 354 fellow players. Legendary online, he once took home over $4 million in a single cash game. He’s managed to extend his streak to live poker games as well. His four bracelets proves this point. He has career earnings of $3,323,752 as of 7/18. The H.O.R.S.E. event had many bracelet winners as well. These tournaments bring a lot of players who are well rounded in the world of poker. Dutch Boyd, Jeff Madsen, Andrew Brown, John Hennigan, Ben Yu where some other notable players who either cashed or were in the event. Check out the video clip below. runitonce in addition to playing. Online poker has made its way to the WSOP and Matthew Mendez has won the $565 Online Pot Limit Omaha event. He went heads up against Hungarian Marton Czuczor. In the end a straight was his game winning hand. Czuczor took home $82,865 for his efforts. “The Grinder” Michael Mizrachi,accomplished of the most amazing accomplishments in poker history. He triumphed over 87 of the world’s best players to win, for the third time, the World Series of Poker $50,000 Players Championship. The high stakes tournament has $50,000 buy-in! This brings his gold bracelet count to 4 and he gets a whopping $1,239,126 for his great run. The win also brings his poker career earnings to $16.7 million. The WSOP Marathon event, a five day tournament, concluded with Australian, Michael Addamo, taking a bracelet and first place. There were 1,637 players for the $2620 buy-in event. The 23 year old took home $653,581. Addamo now living in Thailand due to Australia’s online poker ban, has nearly $2 million in live tournament winnings. His previous best cash was $197, 971 in the PokerStars Championship Macau. Los Angeles business man, Gay Yifrach, won the $3000 Six-max No Limit Holdem event. He dominated over a field of 868 players. He secured a gold bracelet and $461,798. This is the largest cash of his career. Last year he won nearly $100,000 in the WSOP Circuit Bicycle Casino event. The tournament was cut short a day when the players agreed to end it with Yifrach in first place. By that time, his chip lead was astounding. The $1500 Pot Limit Omaha event at the 2018 WSOP was won by Ryan Bambrick. He triumphed over a field of 799 players to take home the gold bracelet and $217,123. Though he’s played online for 15 years part time, he decided to give it go and play full time. This is his fourth cash at this year’s WSOP and first final table finish. He started out as chip leader on the final day and was able to pull it off continuing his climb to the top. Musician Steve Albini has won the 2018 WSOP Seven Card Stud event. He gets a bracelet and $105,629. The field had 310 entries with poker heavy weights like Chris Ferguson, Frankie O’dell and Jeffrey Lisandro among others. A record setting crowd of 5,918 set the tone to a great senior event with Matthew Davis winning the top prize. The pool was $5,326,200 and Davis, a professor, took home the $662,676 along with a gold bracelet. For the event, players have to be 50 and over. Get that 50, FIFTY, and over. The final day saw Davis jump into the lead by knocking out Bill Bennett. He battled it out with Bill Stabler for a while but then regained his lead and took it all the way to the bank. Going from an extremely low chip stack to first place at the final table, Hanh Tran has won the $1,500 Deuce-to-Seven Triple Draw Lowball event at the 2018 WSOP. This is the Austrian’s first gold bracelet and he also takes home $117,282. Though he most plays cash games, this is the largest cash of his poker career. Tran outlasted a field that included Brian Hastings, who was unable to pull it off and took the fifth place prize. The poker pro has done two things. First, he won the $10,000 Deuce to Lowball event. Secondly, he has joined the likes of poker greats Amarillo Slim, Bobby Baldwin and others who have four WSOP bracelets. In this event, he won over a field of 95 players. Even in the event, poker legend Doyle Brunson, who made final table, himself played. The first place finish reaps a $259,670. A limited playing field should mean limited winnings? Not quite. The 2018 Super High Roller Bowl is one of the most lucrative poker events in the poker world with a buy-in of $300,000 . Last year Christoph Vogelsang took home $6 million at the event. This year Justin Bonomo was the man who slayed the donkeys and took home $5 million defeating Dan Negreanu in the process. The poker tournaments was a who’s who of the poker world. Players and personalities like Bill Perkins, Antonio Esfandiari, Fedor Holz, Brian Rast. In fact, anyone with $300,000 to play a poker should be pretty good. It was a collection of the world’s top poker players. The structure is somewhat different. The top seven players are the only ones who cash. For every 20 paid entries, there are two satellite seats available. The tournament is a four day event. For Bonomo, the win was a drop in the bucket for an otherwise stellar year. San Diego poker pro Benjamin Moon won the $1500 NHL Big Blind Ante. The big blind ante format is the new approach to poker tournaments. In the betting, the big blind puts up the ante for all players. In theory it saves time as someone with a low chip stack would put in some rounds all of their chips when it’s their turn at big blind. No waiting for that ace pair with this format. That is the criticism of the format. Those with weak cards would have to use their chips in any case and not hold on to to a small stack in hopes of something better. Nonetheless, Moon won over field of 1300 players. He takes home $315,000. He also gets his first bracelet. Though new at the WSOP, the big blind ante format is de riguer in Los Angeles and San Diego where Moon plays regularly. He says it does in fact play faster. Brazilian restaurant owner, Roberly Felicio has won the Colossus. The tournament had a 565 buy-in and for his work, he took home $1 million dollars. He defeated Sang Liu. He previous won in last year’s Monster Stack. This tournament was also notable since Phil Ivey made his return and cashed in the tournament too. The Colossus entries at 13,000 is the lowest turn out for the event since it started three years ago. Russian accountant Andrey Zhigalov has won the H.O.R.S.E. event at the 2018 WSOP. In doing so, he wins his first gold bracelet and over $200,000 for the first place finish. He defeated a field of over 700 players. He prefers mixed games and has had several cashes in mixed events but this is his largest to date. Amazingly, he came back from being short stacked to taking a huge lead. Justin Bonomo Wins $10,000 Heads Up NHL Event at 2018 WSOP. Taking home his second bracelet and over $185,000 is just another notch on his belt for the year. He came to the final match with a 7:1 chip lead and pummelled runner up Jason McConnon. McConnon took home $115,000 for his efforts. Justin Bonomo is on a roll this year. He’s moved into third place on the money list. This year he added nearly $15 million dollars to his bottom line. He recently cashed for $5 million in the Super High Roller Bowl and $4.8 million in the Super High Roller Bowl China. His live event total is over $32 million dollars and sure to increase at his age of 32. 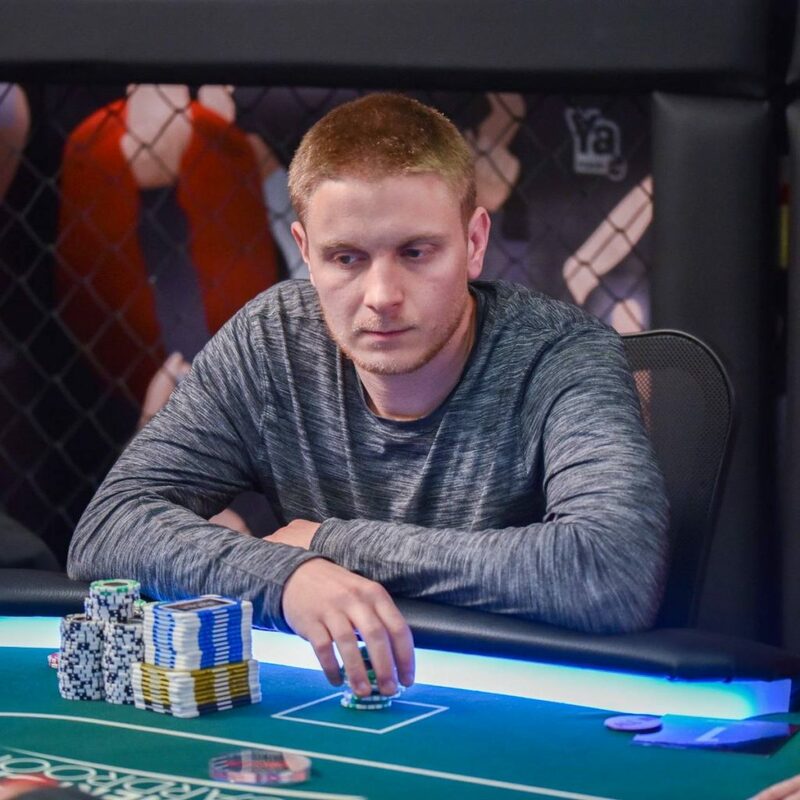 In the WSOP’s first ever $100,000 High Roller event, Nick Petrangelo has walked away with his second bracelet and first place prize of nearly $3 million dollars. There were over 100 entries. The 31 year old Massachusetts native now has nearly $15 million in lifetime earnings. He made “julien” of all his fellow poker players and emerged to win the $1500 Omaha 8 or better event. Though, originally scheduled for 3 days it hadn’t finished and a 4th day added. The field of 911 players “prophetic” were eliminated bust by bust. The heads up came down to Kate Hoang and Julien Martini. Martini won not only nearly $240,000 but also his first bracelet. Runner up Kate Hoang took home $148,000. Elio Fox has won the $10,000 Turbo Bounty event at this years’ WSOP. He took home his second gold bracelet and nearly $400,000 for his efforts. 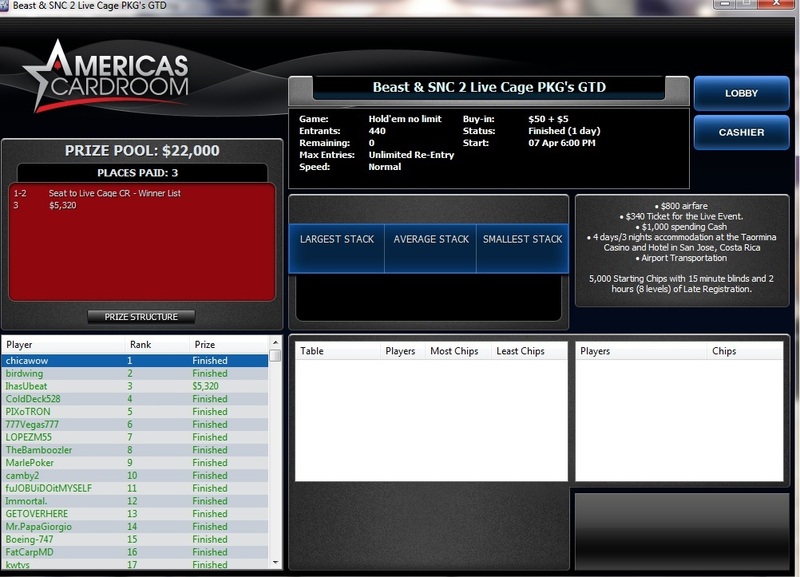 The prize pool of $2,284,200 was split among 37 top finishers. Joe Cada, 2009 Main Event champ, has won his third gold bracelet to win the 2018 WSOP $3000 Shootout Event. He won from a field of 363 entrants including Joseph Mckeehen. For the 30 year old player it brings his winnings to nearly $11 million dollars. A nice sum for a 30 year old. French journalist William Reymond has won the 365 Online event at the 2018 WSOP. He defeated a field of nearly 3000 to claim the first gold bracelet of the WSOP and nearly $155,000. The tournament lasted a grueling 12 hours. The entry fee was a miniscule $365. The Texas Poker Strategy revealed in this article will teach you how to rake it in and get tons of cash in your bankroll and wallet in no time flat. Texas Poker Strategies, do they really exist? Your darn toot in they do, but which ones are the bread winners versus the complete duds? In this article I will uncover a few of the best Poker Texas strategies that will get tons of cash in your bankroll almost every time. First off, I would like to say that if you thought that the majority of Poker Texas strategies are based solely on great positioning? You would be completely correct. The problem with these strategies is that they contain several loopholes that ultimately leave cash on the table. That being said since the name of this game is to clear the entire pot and fatten up your bankroll, then these types of strategies leave much to be desired. Even further the waiting period that is required to get proper positioning often takes too long and ends up getting you kick out of the game. The following are three strategies that are solid money makers without playing the dangerous waiting game. The first Texas Poker Strategy is to carefully observe the scene before you decide to attack any pot. This strategy eliminates the likelihood of you getting slammed by other players that attempt to lead you in to use bullying or aggressive techniques to clean your clock. It is very important to understand that when you wait for the best cards and the prime opportunities to use them you become a better and more competitive player. The next strategy is to keep a close eye on your bankroll. As obvious as this strategy may seem many Poker players get it all wrong and find themselves getting priced out before they know what hit them. Pretty much, this strategy doesn’t really need any more explanation. The last strategy is to take the time to learn your own strengths and weaknesses. This will make you a better player over time because once a weakness is exposed you do what is takes to strengthen yourself in that area. The more you learn, about yourself or the game of poker Texas, or otherwise, the better you will do over time. Simply tasks like researching more Texas Poker strategies, kind of like how you are reading this now, are fundamental activities you need to complete on a daily (or weekly) basis in order to become a true poker star. Do You Want To Learn More Texas Poker Strategy [http://mytexasholdempokertips.com/strategy/texas-poker-strategy-how-to-get-good-at-poker-on-the-cheap/]? Alex is an avid Hold Em Poker player. Shoot him an email at alex@mytexasholdempokertips.com with any questions you have about winning Holdem. The recent media blitz covering high profile events such as the World Series of Poker (WSOP) and the World Poker Tour (WPT) has catapulted the once recluse game of backroom banter onto an international stage donned with high profile personalities and obscene sums of money being wagered at the turn of a card. The notion that competitors could play high stakes poker online could not be conceived in the earlier days of the tournament back in the 70’s when WSOP was changed to an elimination style format. Now evolved, intense games of 100k wagers or better are conducted at Las Vegas poker tournaments at the Bellagio, Mirage, and Palms but with a high-tech twist. Arguably the most famous tournament in which the upper-crust play high stakes poker is the World Series of Poker tournament which is hosted at the Rio Las Vegas casino. Buy-ins generally range from $1000 to $5000 and eventually move upward of $10,000 in the Championship tournament. Players can also enter the tournament by winning satellite tournaments without breaking the bank with buy-ins in the range of $300 to $1000. It is not an unusual event to find every player at the final table of a World Series of Poker Satellite tournament to also be found at the World Series of Poker Championship tournament itself so many players find this as viable alternative to otherwise have to pony up the full $10,000 entry fee in the main tournament. With the recent rise of internet poker popularity, players can also play high stakes poker online to achieve the same goal. Online World Series of Poker Satellite Tournaments are held during the entire year. The convenience of playing high stakes poker online is unsurpassed if you’re looking to get in on high stakes action without breaking the bank. Real money poker sites have become wildly popular with stories of players winning pots in amounts as high as 400k or better. These players understand that when you play online poker for real money, bankroll management and patience are the keys to success. Be sure to play at an online poker room with a large player base so that satellite tournaments are held more frequently and most of all don’t forget to put on your best poker face. Find the best online poker site where you can play high stakes poker [http://www.thebestplaypokeronline.com/play-high-stakes-online-poker.html] online without breaking the bank. High Stakes Poker – Are You Ready to Play Today and Win? When you hear “high stakes poker,” you would probably recall the hit television show on cable which started way back in 2006 and had run for already five seasons, the last of which ran on March until May of 2009. It is the same thing as saying there are poker gambling sites being run by individuals or groups, such as Pokerstars.com, that involve high stakes betting or gambling. They are considered high stakes gambling because of the amount of money being shelled out by many people and all that money are put as pot money for each poker game. Different types of gambling can involve high stakes and the most popular nowadays is betting on poker. High stakes poker involves a great amount of money from poker players. Most poker players are very much experienced because they are the people who earn money from their businesses or jobs enough to be able to bet thousands of dollars on poker. They are also poker players who are serious about the game and are very much in the know of the ins and outs of poker. These are veteran poker players, rich poker players, celebrities, and big-time business owners who have that much money to bet their way into winning poker. These games are usually played inside rooms which are maintained by high-level security and are usually private. There is not much difference between the regular poker game and poker. The only difference is the very large amount at stake when a player wins the game. The pot money is taken cared of by a group or company until the money is claimed by the winning party. This is how poker games are run, and the most popular way to play poker would be to do it through online gaming websites, such as Pokerstars.com, Partypoker, and many other poker game sites which allow high stakes betting and gambling. If you would like to try playing the game and you have the money to bet on these high stakes gambling sites, you should expect that the games can be fast and the money can become gone as fast as a snap as well. This is the reality when it comes to these online poker gaming sites. If you are very optimistic that you can win, then you can go ahead and try to play poker with other online poker players. Get to know the game by playing real-time and mingle with other poker players through poker game forums available on the websites. You can also start winning by learning your opponents’ styles and by studying your hand history which can be retrieved through your online poker game. High stakes poker is a serious game and should not be entered into lightly. You can lose a lot of money from betting, and unless you are ready to lose, you should think more than twice about joining. There are online poker training tools that can help you get a head start on your poker game strategy. Learn more about the game by reading e-books on poker and learn the good and bad sides of playing high stakes poker from poker players themselves on online forums or poker community blogs. Ready to win hundreds or even thousands from playing high stakes poker? We expose exactly how you can do it at http://www.PokerSystemsExposed.com.� For a limited time you can get FREE tips to win online poker tournaments! In High Stakes Poker it is possible to observe such a Multi-level Thinking (MLT) that only the best of the best are capable of doing. In High Stakes Poker many great players play and it is a perfect opportunity to learn from Ivey, Dwan, Negreanu, Brunson, Hansen, Antonius or Farha. It is really amazing what goes through their mind during a given hand. In this article there is a little theory about MLT thinking and then comes a very interesting hand played between Eli Elezra and Gus Hansen in High Stakes Poker Season 6. It is time to check out the memorable hand between Eli Elezra and Gus Hansen. There are eight players at the table, the blinds are $400/$800 with a $200 ante. The stacks are extremely deep, most of the players bought in with $200 000 but Dwan and Ivey with $500 000 each. Gus Hansen raises to $4 200 in the fourth position with a speculative hand: 4s6s. Tom Dwan does not need too much of a hand for such a call but this time he even has a hand and makes the call (6cAc). Eli Elezra finds 8hKh in his big blind and decides to make the additional $3 400 to play the hand. The pot is $14 600 and three of them see the flop. Elezra says: “I check in the dark.” This is an interesting play and has happened already a few times in High Stakes Poker to mislead the opponent and not give away kind of information about the hand. However he says right away: “No, no, no, wait! I did not check down there!” The following cards hit the table: Ks9h3d. And then the king hits and Elezra still checks his hand. Hansen as the original aggressor makes a $9 900 continuation bet (c-bet). Dwan folds quickly and Elezra makes a fast call. As you can observe the c-bet did not mean much to Elezra. He knew Hansen would make that bet with any kind of a flop, no matter if he hits or completely misses. There are no draws on the flop so Elezra decides to call and see how the hand further develops. The call seems reasonable because with a weak kicker (the eight) Elezra is probably worried that Hansen also has a king with a better kicker therefore he does not reraise. It is also interesting to mention Dwan’s play. He usually does not give up his hands so quickly and makes a call with nothing so he can bluff his opponent out at a later point of the hand. However with Elezra sitting behind him, he does not know what comes next so he makes a quick fold. The river is the As. Elezra checks, Hansen counts his chips and bets $62 200. Now this is the interesting part. This is where MLT comes into play. Elezra knows Hansen very well and they have played many times together. He knows that Hansen is capable of shooting three barrels with nothing. Knowing that there is $147 600 in the middle, Elezra gets very good odds on his money. If he puts on Hansen on the four hand types as I have done and he thinks he would only win 1.5 times out of 4, it still makes sense to make the call. What I do not know is how Elezra gives the percentages of the four possible hands to Hansen. When I say the odds I consider the fact that there is a 25% chance for all four possibilities. Elezra knows Hansen a lot better so he might think the chance of a bluff is 40% and the other three possibilities are equaled at 20%. In this case the call makes even more sense. If he thinks Hansen has a 40% chance of having a monster and the other three possibilities have 20% then the call does not make so much sense. Elezra actually does not even think long, makes a fast call and wins $209 800. Hansen said after the hand that he had already decided before the river card that he would use the third barrel to chase Elezra away, but he did not want to see an ace. He pulled the trigger anyway (as Gabe Kaplan said). He did all the thinking and possible reactions of Elezra even before the last card hit. However Elezra is also a world class player and he read Hansen perfectly. What can I say at the end of such a wonderful hand? It was very interesting to see it on TV and analyze it later on. For sure for me it would have been a lot harder to make a $62 200 call on the river with a king. There must be a reason why those players are sitting at the High Stakes Poker table. Their way of MLT makes them special players who can make great reads on their opponents. If you would like to see deeper analysis with the concrete numbers and chances, please visit our website and take an active part in the analyzing process. Interesting news and poker hands [http://www.howtolearnpoker.net/2011/04/eli-elezra-vs-gus-hansen-in-high-stakes-poker/] – learn poker with real money hand analysis so you master poker strategy not only theoretically but in practice! Among the creme de la crop of highstakes poker players is Erik Seidel. This one time stock broker proves that poker is a skill not luck. He’s nearing 60 and winning highstakes games just as when he was much younger. Let’s take a look at this fascinating man. He started out playing backgammon but at Brooklyn College, he shifted to poker and hasn’t looked back. He started as stock broker on the American Stock Exchange and joined the Mayfair Club in New York. The Mayfair Club was a cardroom in New York that was originally a bridge and backgammon club. It shifted to poker and cranked out some of the top poker players of the day including Jay Heimowitz, Mickey Appleman, Dan Harrington, Howard Lederer, Stu Ungar and more. The club was closed in 2000. But this was the area where Erik Seidel got the skills. In May 2015, Seidel won the European Poker Tour Super High Roller for over $2 million dollars. And that’s just part of his winning for that year. In 2015, Seidel took home over $4 million dollars in live tournament events alone. This doesn’t include private tournaments with wealthy high rollers or online games. In 2016, he took over $3 million dollars including a $158,479 win at the European Poker Tour Grand Final in Monte Carlo. He’s truly in the poker elite. Seidel won the World Poker Tour at the 2008 WPT Foxwoods Poker Classic for $992,890. In 2011 he was runner up for $155,103. Other notable World Poker Tour finishes include the WPT Five Diamond Classic where he took 4th place for $335,160 in 2016. Seidel was runner up in his first major WSOP in 1988. He made the final table again in 1999. He’s had many cashes there and has won eight bracelets, the most recent in 2007. He is a flexible player with bracelets in Holdem, Omaha, and Deuce to Seven Draw. Only five other players have more bracelets than Seidel. Seidel is a frequent casher at the Aria High Roller Bowl, a monthly tournament with today’s top players. His largest cash there was for over $500,000 in 2016. Seidel in 2017 shows no signs of slowing down. His total earnings for the year that’s not even over yet are over $2 million dollars. His largest cash this year was the Poker Masters Event for almost $600,000. He also placed 3rd in the PokerStars Monte Carlo Eight Max for $461,570. The amazing thing about Seidel is he’s older than most of players out there. Highstakes or low stakes, poker is poker and Seidel has seemed to master the game to perfection.